!! श्री श्री वेणु गीत !! 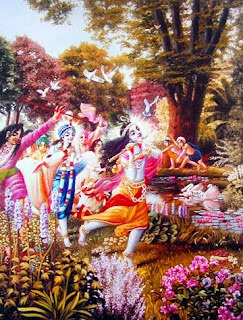 "Shri Krishna entered the forest of Vrindavana with the cows and cowherd boys and began to vibrate His transcendental flute..."
Madhupati Shri Krishna was very much pleased with the atmosphere of the forest, where flowers bloomed and bees and drones hummed very jubilantly....While the birds, trees and plants were all looking very happy, Shri Krishna, tending the cows and accompanied by Shri Balarama, who was playing his buffallo horn's flute and the cowherd boys, began to vibrate His transcendental flute..."
Thus the gopies gathered at a place and they speak amongs themselves. “O Sakhi...Anyone can drink this nectar by going close to Kanhaiya... Yet so many people are going to see Kanha... How can we be so shameless as to step in front of them as He passes? Let us rather go to a Kunja or see Him from a distance... Let us stand somewhere so that Krishna will also see us... We cannot get nearer to Krishna, but if He sees us, we can drink the nectar from His sidelong glances..."
The sound of Shyamsundar’s flute steals the minds of all living beings, both animate and inanimate... 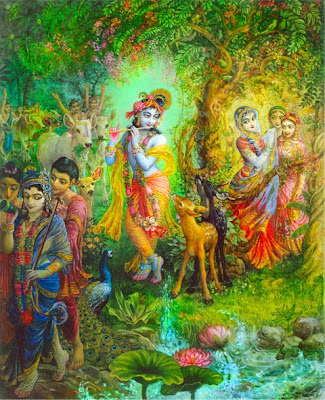 When the young gopis of Vraja heard that sound, they began to describe it... The gopis ears are like cups filling up with nectar... When they overflow, they begin to discuss Shyamsundar’s pastimes and qualities among other gopis of a similar bhava... They talk about Shyamsundar, about His flute, everything about Shyamsundar. 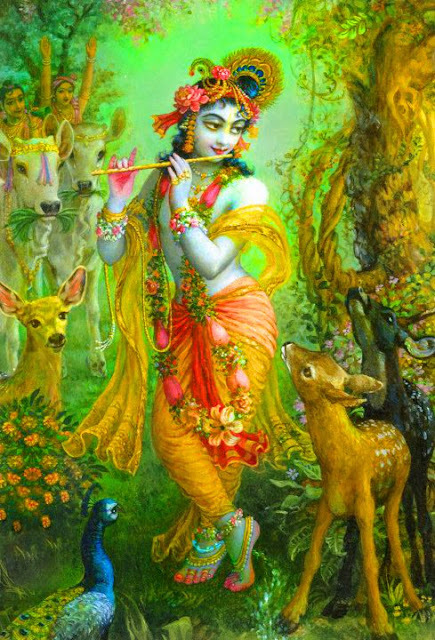 ...With their enormous eyes, expanded like the petals of a lotus flower, they are offering worship at the lotus feet of Shri Shyamsundar and accepting His invitation, which He extends by casting loving, sidelong glances....Truly, the lives of these deer are blessed. 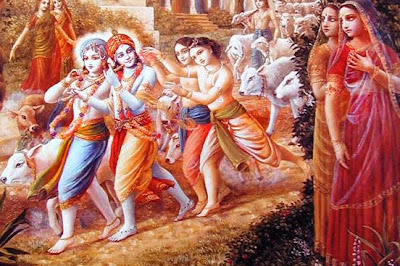 (Although we are gopis of Vrindavana, we are not able to offer ourselves freely to Krishna in the same manner as the deer, for our husbands and elders restrain us and beat us – what an absurdity!)" 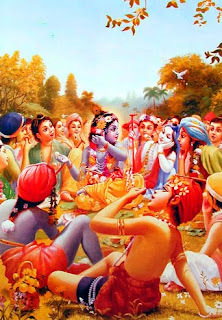 Thus, Everyday the gopis, being deeply immersed in prema, discuss among themselves the innumerable pastimes of Shri Krishna who plays in the forests of Vrindavana... By doing so, they enter a state of ecstatic trance of meditation upon Him... 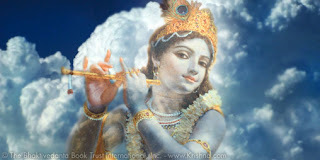 In this way, the pastimes of the Lord continuously manifest within their hearts. 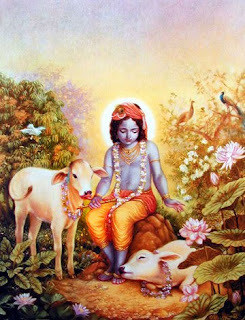 While Shri Krishna was engaged in tending the cows in the forest of Vrindavana or on Govardhana Hill, the gopies in the village were always absorbed in thinking of Him and discussing His different pastimes... 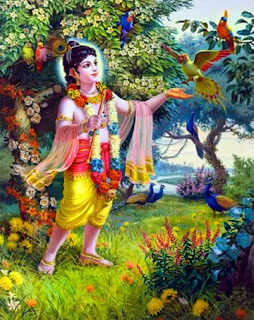 This is the perfect example of Krishna consciousness: to somehow or other remain always engrossed in thoughts of Krishna. 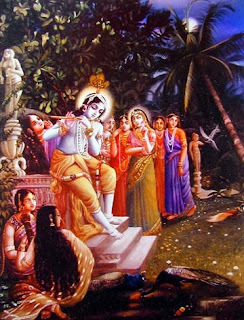 The vivid example is always present in the behavior of the gopies; therefore Shri Caitanya Mahaprabhu declared that no one can worship the Supreme Lord Shri Krishna by any method which is better than the method of the gopies...The gopies were not born in very high brahmana or kshatriya families; they were born in the families of vaisyas, and not in big mercantile communities but in the families of cowherd men... They were not very well educated, although they heard all sorts of knowledge from the brahmanas, the authorities of Vedic knowledge... 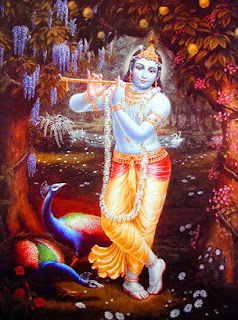 The gopies only purpose was to remain always absorbed in thoughts of Krishna. This Divine Venu Geet's Source is "SRIMAD BHAGWATAM"
"Shri Shri Venu geet is sung by the Gopis in praise of Shri Shyamsundar and his flute... 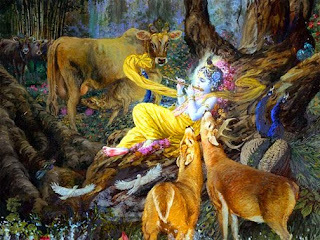 It is an account of the Gopis reacting to the sound of Shri Shyamsundar's flute as he herded cows in the surrounding forest of Vrindavan... Shri Venu Geet vividly describes Shri Shyamsundar, the natural surroundings of Vrindavan, River Yamuna, trees, bamboo bushes, birds, deers, clouds, apsaras and simple women, and of course the cows and calves responding to the song of love that the flute brings to those receptive to it...."
"In order to bestow mercy upon the devotees as well as the conditioned souls, Shri Krishna manifests His humanlike form and performs such extraordinary pastimes that anyone who hears them becomes exclusively devoted unto Him."